The delicious Tasty Snacks are made with high-quality hard cheese and are produced using the best ingredients and contain no grain or added sugar. 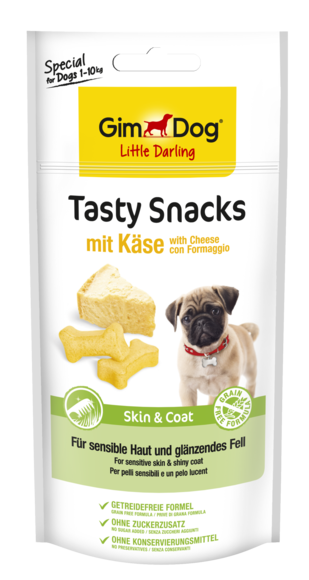 Tasty Snacks Skin & Coat – for sensitive skin and shiny fur. Small dogs tend to have sensitive skin, particularly if they have light fur. This specially developed snack contains biotin and zinc and helps to keep skin healthy and fur soft and shiny. 8 pieces per day for a 10 kg dog. Please ensure fresh drinking water is available at all times.